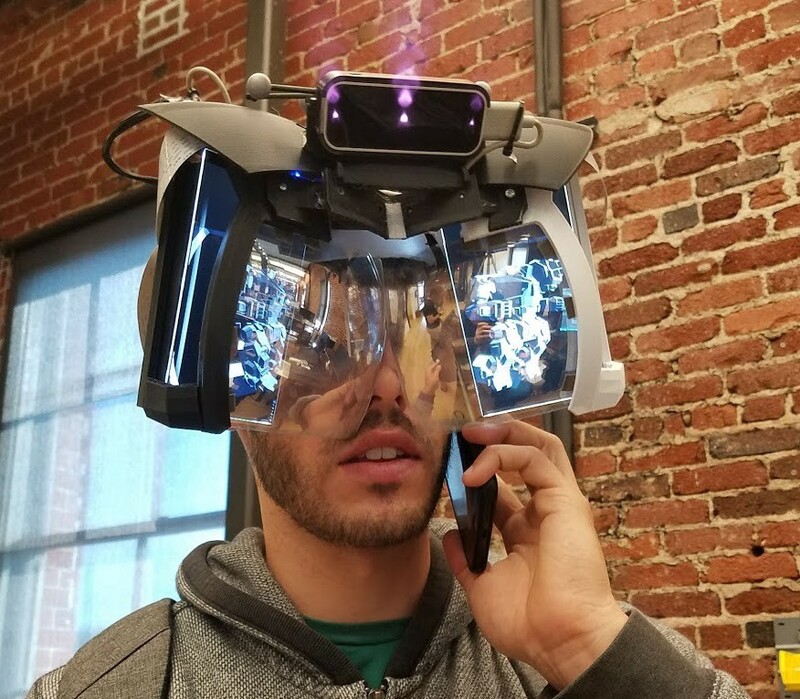 Augmented Reality headsets are so new that the industry tends to compare headsets with vastly different designs as if they were the same technology. This is like categorizing all mountain bikes as “Bikes”; a dual suspension, $10,000 Yeti has a drastically different experience than a $179 Schwinn. 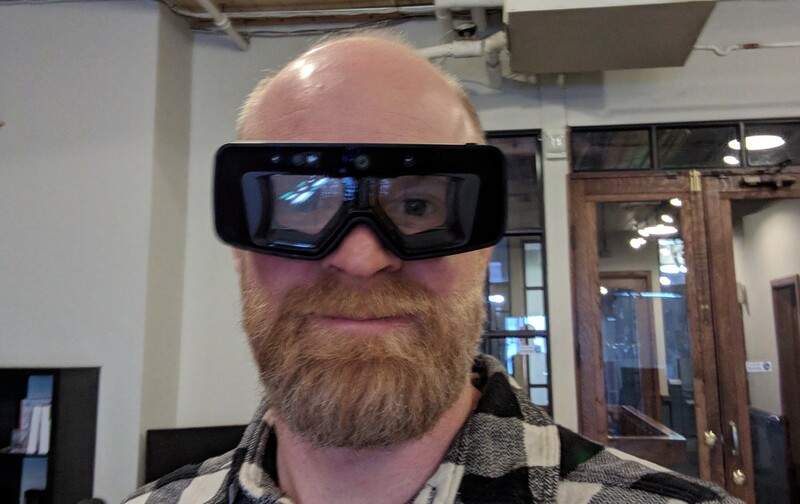 As with bikes, the overall experience of an AR headset can vary dramatically. In this post, we’ll dive into optical designs and cover the three of the main types: “Birdbath,” Curved Mirror Reflector aka “Bug Eye,” and Reflective/Diffractive Waveguides. How it works. The birdbath optical design projects light (indicated with a blue line in the diagram above) from a display source (black rectangle perpendicular to the forehead) onto a piece of teleprompter glass (Beamsplitter) placed at a 45-degree angle. The Beamsplitter glass has reflection and transmission values (R/T) that allow the light from the display source to be partially reflected, at the percentage of R, while the rest is transmitted through at the value of T. Having both R/T allows the user to see both physical items in the world next to the digital images produced by the display. The light rays that get reflected from the beamsplitter bounce onto the combiner, a concave mirror that redirects the light back into the eye (dotted line in image). Headsets that use this optical design: Lenovo Disney Jedi Challenge, and the ODG R8 and R9. Hardware Components: Lower cost headsets like the Lenovo use an LCD display, such as a cell phone screen, while more advanced systems like the ODG R9 use OLED microdisplays. The microdisplays are more expensive but improve the size of the headset dramatically (compare the massive Lenovo (above) to the ODG glasses (below)). As far as optics go, beamsplitter glass and one way mirrors for the combiners are commonly manufactured at a low cost. Field of View: This design has a medium FOV. ODG R9 has a 50 degree FOV which is at the upper range when compared to high-end waveguide technology (see below) but smaller than most curved mirror designs. Light loss: In a 50/50 beamsplitter, there is a 50% light loss on the first bounce, additional loss when the light hits the combiner, and another 50% loss as the light rays travel back through the beamsplitter and are eventually projected onto the eye. To compensate for the significant loss of light the lenses are very dark, similar to wearing sunglasses indoors. Form Factor: If an LCD is used as a display source (Lenovo) the limitation surrounding optics result in larger headset designs. Micro OLEDs reduce the size of the headset, but add supply chain and costs difficulties with only a handful manufacturers. Image Quality: When the light source is reflected off both the interior and exterior of the combiner it can cause unwanted images commonly referred to as ghosting, see image below. LCD displays will also have larger pixels (low pixels density) since the 1080p image on the the display source is expanded. Micro displays offer a much higher pixel density so they can generate a high resolution in a very small form factor, but at the cost of decreased brightness. Lens Transparency: As previously mentioned, a dark lens is often placed in front of the glasses making it difficult to see a user’s eyes, especially indoors. How it works. 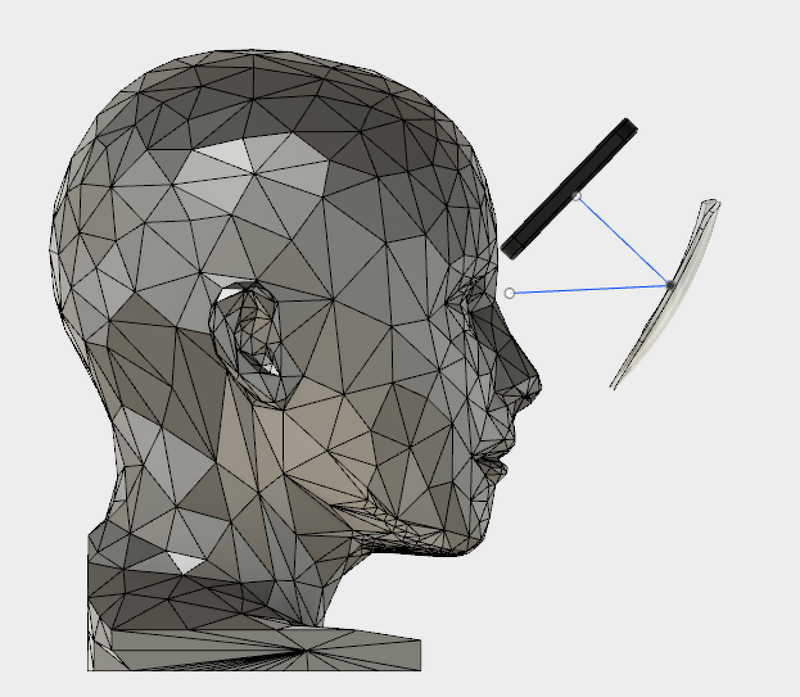 A Bug-Eye headset has a relatively simple optical design. It uses a cheap LCD display source and a curved mirror with reflection/transmission (R/T) values that act as a mirror and combiner. The light emitted from the display hits the concave mirror/combiner directly and reflects back into the eye. The ideal positioning of the display source is centered and at a parallel angle to the mirror. 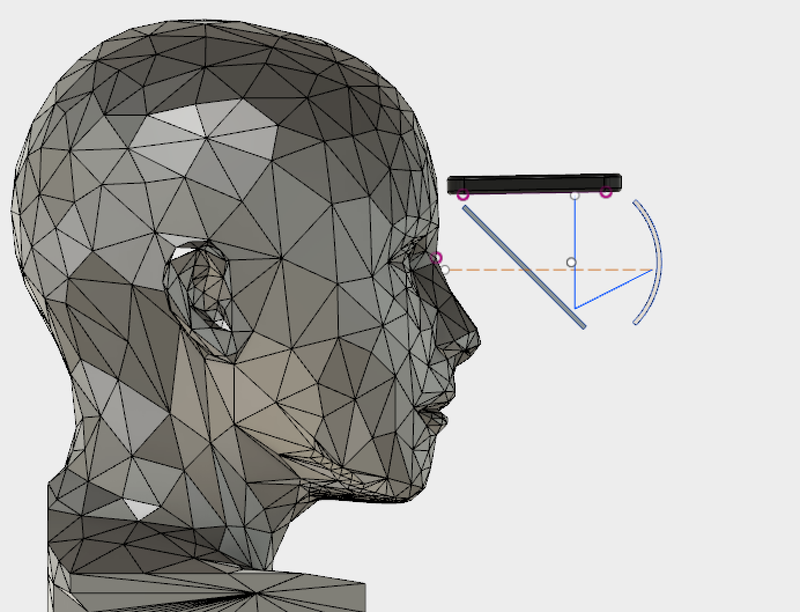 Technically, the ideal position would have the display source covering the users eyes, so most designs move the display “off-axis”, above the forehead. An off-axis display on a concave mirror has distortion that requires corrections to be made on the software/display side. Hardware Components: The LCD display can be a phone or off-the-shelf LCD panels. While the lenses for these devices can be manufactured, they require a custom application of optical coatings. 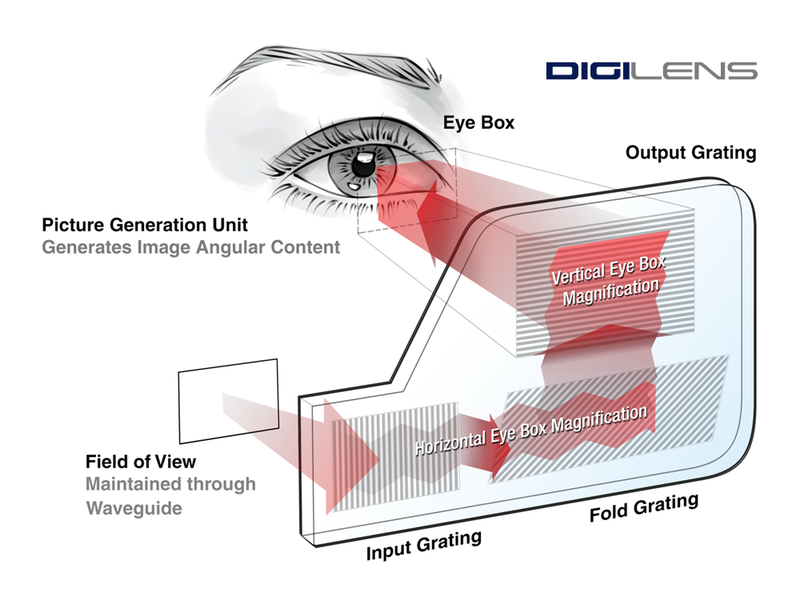 Field of View: With the display positioned further from the eye the FOV can be significantly larger than what is currently possible with waveguides (FOV can range from 50 to 105 degrees). Light Loss: Since the light is only traveling through a single combiner/lens the light loss limited to “one-pass”, and is much lower than the Birdbath design. 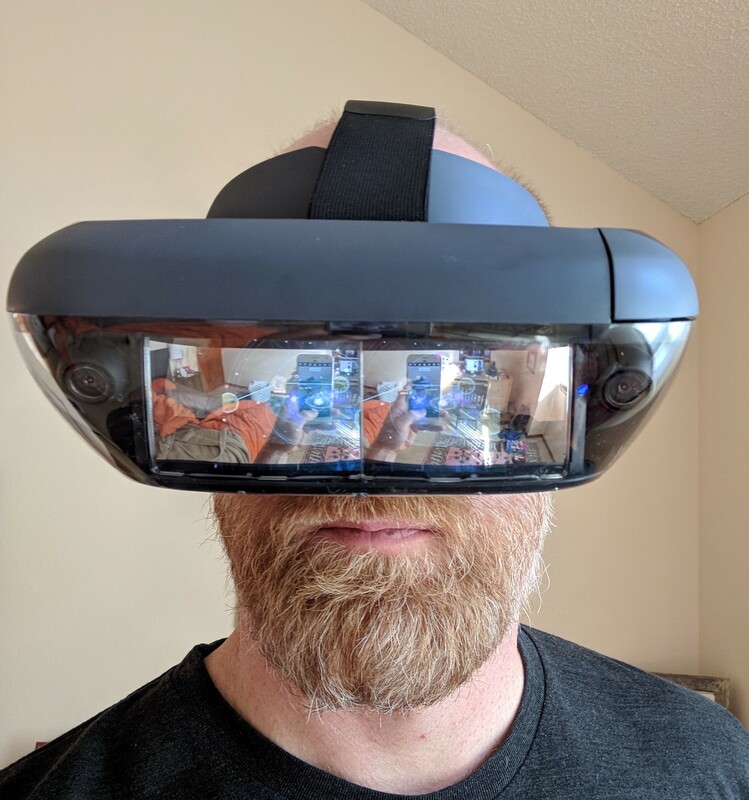 Form Factor: To expand the digital image and make it big enough to place in the real world the LCD source needs to be a sufficient distance from the lens, giving the headset a protective visor look and feel. Image Quality: Pixel density can be an issue with this design, especially if a cell phone is used as a light source. One way to help improve pixel density is dual LCD displays. 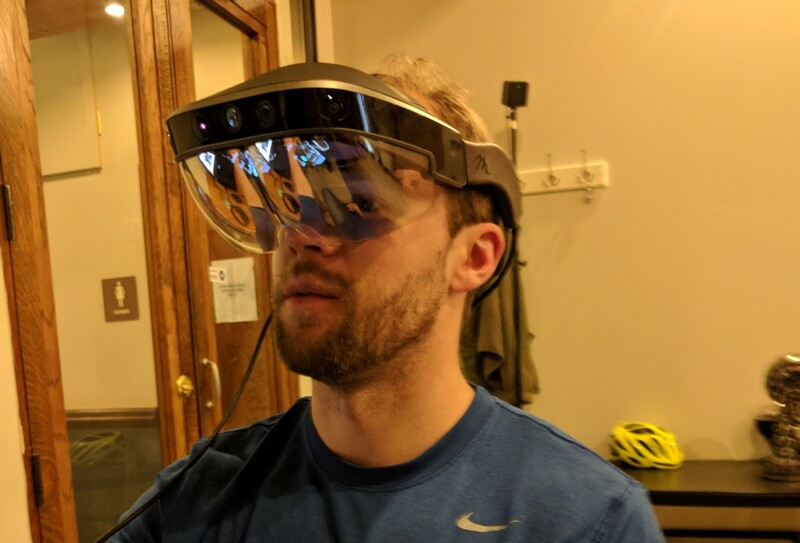 The Leap Motion headset used two LCD displays that were 1600 X 1440. Lens Transparency: The light loss issue is somewhat mitigated with a bright LCD and fewer substrates to travel through, these displays can afford clearer lenses (higher R/T values). 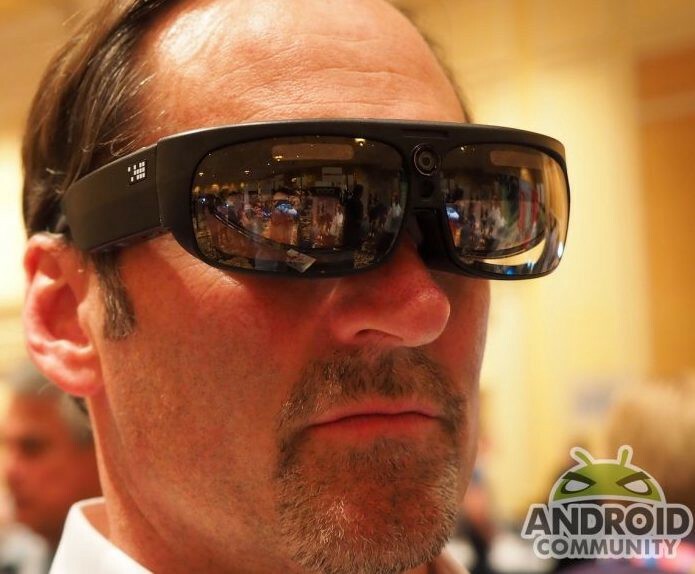 As seen in the image above, the Mira lenses are transparent enough for a person can make contact with a someone wearing the headset. How it works. Waveguides represent a new form of optics technology, while still under development offers significant advantages in terms of form factor, clarity and ghosting. The display source is usually side mounted, using a Liquid Crystal on Silicon (LCOS) or DLP display. Both LCOS and DLP shoot collimated light rays through a diffraction grating that redirects light and eventually forms an expanded image, which is then projected it into the eye. While there is a lot of excitement to waveguide displays and the high-resolution AR experience, they are also the most expensive to manufacture and have significant reject rate. The prices of waveguides are expected to come down with better manufacturing processes, but today they are still a significant amount of cost for a high-end headset. Headsets with waveguides are retailing in the $3000 to $5000 range. Hardware Components: Diffractive waveguide optics are multilayered with a layer for each color. There is a high rejection rate in manufacturing due to the difficulty to align the diffractive RGB layers at a nanometer scale. Reflective waveguides, patented by Lumus, avoid the multi-layered approach making them easier to manufacture. Liquid Crystal on Silicon (LCOS) is typically used as a display source because it’s a compact and provides collimated light, a requirement for waveguide technology. 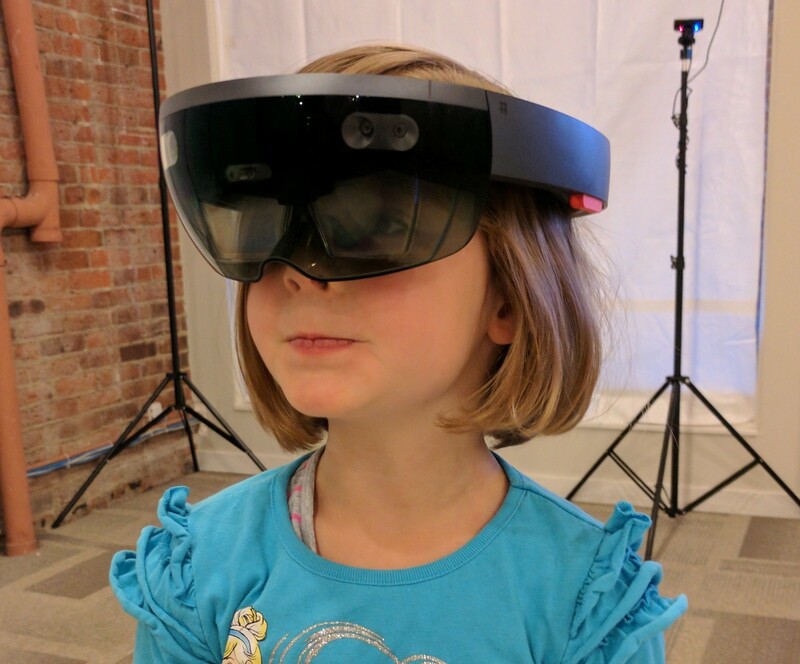 Microsoft Hololens, Kids love AR treasure hunts! Field of View: FOV is very small in comparison to other displays. 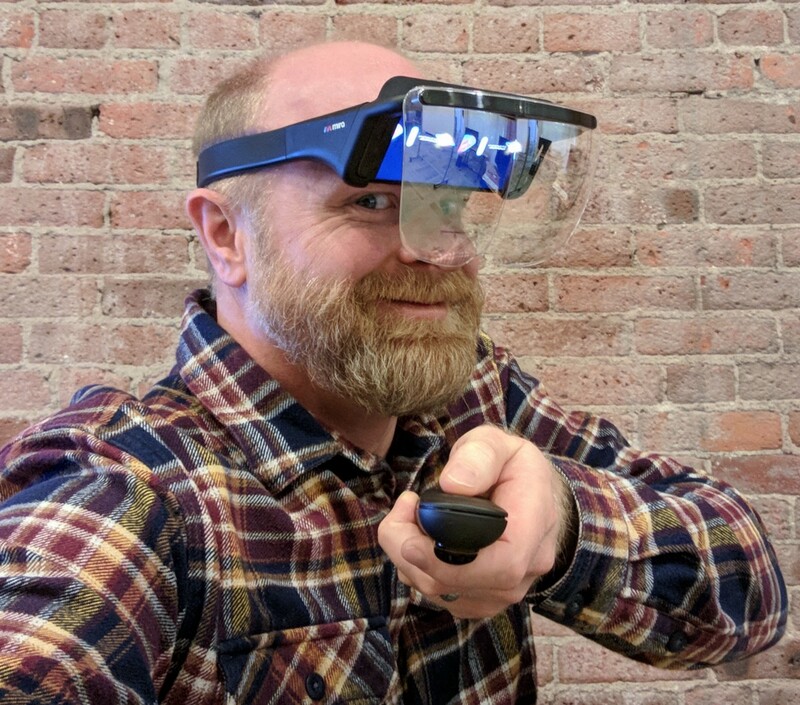 This is the primary complaint with the Hololens. Today, a 40-degree FOV is the standard while companies are pushing to obtain a 50-degree without any degradation in quality. Image Quality: Waveguide displays are the brightest out of all the optical designs and don’t have a ghosting effect. Most of the displays available today are 720p, but this will soon change. At CES 2018 Lumus had the OE vision on display, which had a 1080p display and a 40 degree FOV. Form Factor: This technology is getting closer to a glasses like form factor, but the other realities of building an AR headset such as: The need for a display source, cameras, IMUs on the headset make a sunglasses form factor unachievable in the immediate future. Lens Transparency: No tinting necessary, as you can see in the DAQRI photo below the lenses are quite clear and are ready for indoor use. Like all hardware products, the aforementioned headsets are designed with a series of trade-offs. The pros of and cons of each electronic part, placement, weight, size, price and more, are carefully considered, with each choice constraining the path forward. At present, we see the LCD Curved Mirror/Bug-Eye design as the most tractable choice considering the accessibility and cost of materials (more on this in the next post). 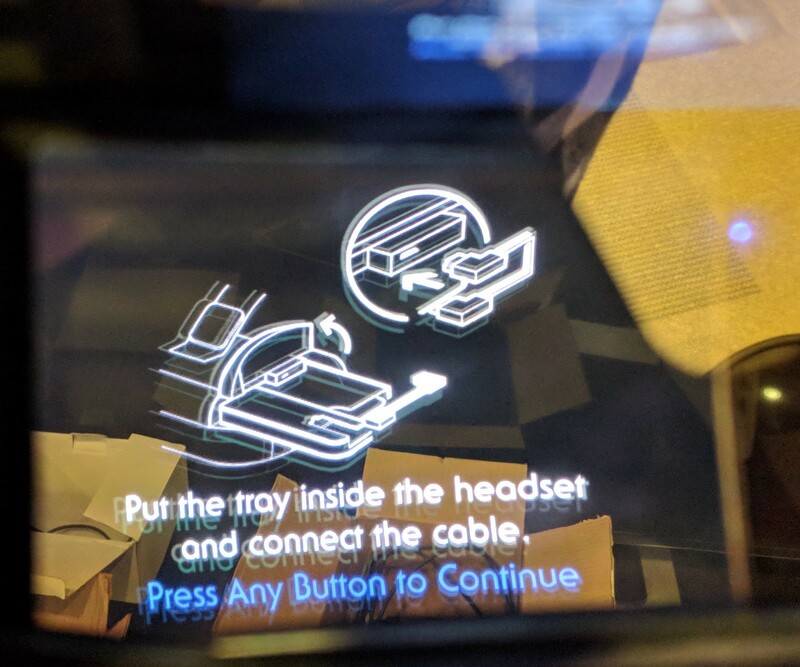 However, this design choice is not the long-term path for AR headsets; LCD Curved Mirrors will soon be displaced by microdisplays and/or waveguides in the next 12 to 18 months, as production lines ramps for each of these components. As a consumer, this is amazing news. In the near future, a more compact form factor will be common and affordable!